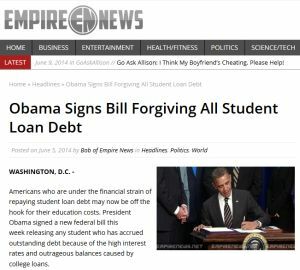 By Louis Jacobson on Monday, June 9th, 2014 at 4:38 p.m.
No, President Barack Obama didn't say he was forgiving all outstanding student loan debts. It's just a bit of satire (if you can even dignify it that way). This is the actual speech President Barack Obama made from the White House on June 9, 2014, before signing a presidential memorandum on reducing the burden of student loan debt. Sometimes art mirrors real life so closely that it’s hard to tell the two apart. 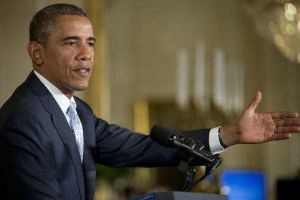 On June 9, 2014, President Barack Obama made a speech announcing a "presidential memorandum" that allows 5 million federal student loan holders to cap their monthly payments at 10 percent of their income. That announcement followed the introduction of a Senate Democratic bill that would aid borrowers in two ways. The bill would allow students with existing debt to refinance to the interest rate new borrowers can get -- 3.86 percent. The bill also offers an option to refinance private student loans into the federal student-loan system. Right around the same time, debt-laden Americans were noticing chain emails and social media posts with a headline that offered something even bolder -- "Obama Signs Bill Forgiving All Student Loan Debt." A PolitiFact reader was skeptical and asked us to look into it. As is often the case these days, we found that this "news" cluttering up users’ inboxes and feeds was a bit of satire -- or, to those unable to detect much humor in the item, a sly bit of clickbait designed to generate ad revenue. "Americans who are under the financial strain of repaying student loan debt may now be off the hook for their education costs. President Obama signed a new federal bill this week releasing any student who has accrued outstanding debt because of the high interest rates and outrageous balances caused by college loans.
" ‘Any student, past or present, who has taken loans from the federal government within the last 10 years to pay for higher education, will no longer be required to pay back those loans,’ said President Obama. ‘This forgiveness also is to be extended to any student currently enrolled in college, who may need financial assistance for the next several years as they finish their degrees.’ "
If you’re a student with a lot of debt, this sounds great. But it’s too good to be true. The federal Consumer Financial Protection Bureau estimates that outstanding student loans total roughly $1 trillion. That works out to about one-third of the entire annual federal budget -- an enormous amount that, even if it was phased out over a few years, would lead to even greater deficits, budget cuts or tax increases. Using a back-of-the-envelope calculation, phasing out just one fifth of the student debt total each year for five years -- $200 billion a year -- would mean adding an annual outlay equal to today’s combined budgets for the departments of Agriculture, Commerce, Energy, Homeland Security, Housing and Urban Development, Interior, Justice, Labor and Transportation. As it turns out, the article was never even intended to be accurate. Empire News has a "disclaimer" page that says, "Empire News is a satirical and entertainment website. We only use invented names in all our stories, except in cases when public figures are being satirized. Any other use of real names is accidental and coincidental." The article’s focus on student loans gains some believability from Obama’s long association with the topic. For instance, during the 2008 presidential campaign, Obama promised to overhaul the government’s relationship with private student lenders and ensure that the maximum Pell Grant award is increased for low-income students. Both of those earned a Promise Kept on our promise tracker, the Obameter. The Senate bill, which Obama has endorsed, would allow existing student-loan borrowers to refinance at lower interest rates, which backers say could "save a typical student $2,000 over the life of his or her loans." The pending measure, sponsored by Sen. Elizabeth Warren, D-Mass., faces a tough road to enactment, even with Obama’s support. Republicans oppose the measure, which Warren wants to pay for with an income tax hike on Americans who earn more than $1 million a year. Emails and social media posts are circulating a claim that "Obama Signs Bill Forgiving All Student Loan Debt." But while Obama has taken executive action and called for passage of a student-loan refinancing bill now pending in the Senate, he didn’t say he was planning to forgive all student debts -- a far more massive undertaking. The claim is ridiculously false, so we rate it Pants on Fire. Published: Monday, June 9th, 2014 at 4:38 p.m.